This isn't something I would have chosen for myself. I like the orange but its not a colour I buy very often and the dyed effect isn't something I would go for. 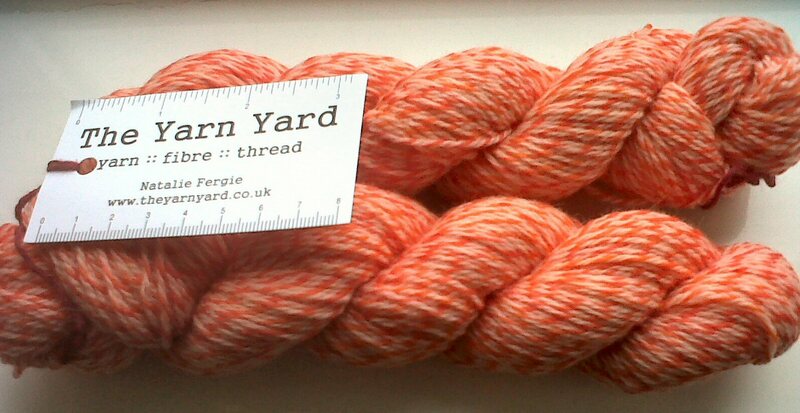 However the whole point of signing up to a yarn club is to get something which is outside of my comfort zone. The first two instalments have been very "me" in terms of colour and variegation. This one is pushing me a little to accept something different. I'm not quite sure what it is going to end up with. I've had other ideas for my wall hanging I'm planning so I have a feeling all these yarn club instalments are going to end up being socks, because a girl can never have too many pairs of hand made socks! So now all I need is some ideas for what to use this yarn for. Otherwise its going to become vanilla socks, along with a large percentage of my sock yarn when I get back into sock knitting. Soon hopefully, although at the moment I am completely in blanket mode - more on that tomorrow.